When you select, Install, it download the theme i believe. You are probably the only person iv'e seen here besides me who wants this as well, since it is a bit tedious changing view each time you change a theme, especially when you have a lot of platforms/playlists, and if you use separate themes on some platforms/playlist. Also it would be cool, if you use different themes on platforms/playlists and you just want to change the Main theme, but not the seperate Platform/playlist themes, have bigbox give you an option when selecting a main theme, if it was able to detect if some platforms/playlists have a different theme from the main theme and ask you, do you want to apply this theme globally or do you want to replace all separate themes, or something like that. Are you talking about Bigbox Startup videos? i see what you mean, but i was thinking about when you upload your theme in the forums. So i guess its not a big deal. Cant wait to use the Editor. I think there should an option in the editor to disable or not allow editing of a theme after its published but the theme creator can still edit it obviously, so people cannot edit a theme without the theme creators permission. This way it minimizes so many variations of the same theme. 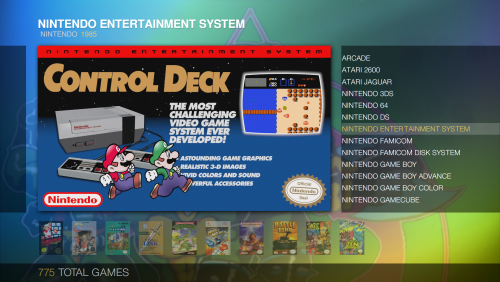 I just tried the new theme Manager, and i like it so far, but if you have many themes like i do and you scroll down the list, the text doesn't scroll, only the selection box moves. Thanks again @Jason Carr for all your hard work😎 -Edit- It would be a nice feature when in the theme Manager, when in the details tab you can click on an image and view it in full screen or if there is a video trailer of a theme. And i can see a manager for startup videos, where you can download startup videos and choose the default video, and have an option to have it play a random video when you start bigbox. I haven't seen that feature requested enough, but that doesn't meat that @Jason Carr wont consider adding it later. i hope that this helps you out No, the developers have to manually convert their themes. go into a platform, and press J on the keyboard, and select the Coverbox theme for the platform, until @faeran combines the themes into one, that is the way to do it right now. This is a great theme, and if you use the nosh on this theme for bigbox, it will give it a unicorn look across both programs. This theme looks great, and i wanted to know, if you can add the clear logo for the platforms and games, thanks. Looking forward to the next update. I added more Logos by request and you can download them now. its certainly could be possible with the grid view. Thanks Jason. Keep up the awesome work.